With a firm texture and rich green color and taste reminiscent of long-ago afternoons on the porch, Blue Lake matures its bountiful crop early and all at once. 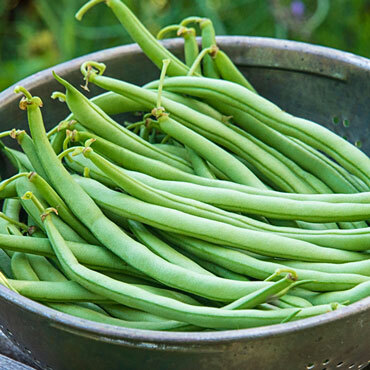 Its slow seed development allows its 6.5" pods to stay smooth, but once established, pick often to encourage more beans to grow. The Mexican Bean Beetle is a common pest, so we recommend using our Bulls-Eye™ Bioinsecticide. If you prefer not to spray your plants, try this instead: plant a fall crop 75 days before the first frost. The Bean Beetles will be long gone by the time beans begin to form! 58 days to maturity. Botanical Name: Phaseolus vulgaris 'Blue Lake 274'; Family: Fabaceae/Leguminosae (Bean Family). Height: 12 - 22 inches. Spacing: Sow 1 inch apart, thin plants to 2 - 3 inches apart, 24 - 36 inches between rows. Days to Maturity: 58 days. Yield: 120 lbs. per 100 foot row. Fruit: Dark green pods with white seeds, stringless. Soil Preference: Rich, well-drained soil; pH 6.0-6.8. Form: Annual. Upright, no staking required. Seed Count: 2 oz. packet is approximately 150 seeds, 1/2 lb. is approximately 600 seeds and 2 lbs. is approximately 2400 seeds. Size: 6 to 6 1/2 inch pod length.